This Premier Range peak is named for Mackenzie Bowell (1823-1917), who became prime minister of Canada on John Thompson’s death in 1894. Bowell was born in Suffolk, England, and came to Upper Canada with his parents in 1833. Elected to the House of Commons as a Conservative in 1867, he acted as spokesman for the Orange Order, of which he was grand master. 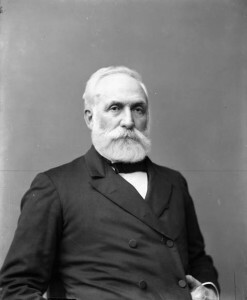 He was minister of customs in Sir John A. Macdonald’s cabinet in 1878-9, minister of militia in the ministry of Sir John Abbott in 1891-2, and then minister of trade and commerce under Sir John Thompson. In 1896 seven of his ministers resigned over prime minister Bowell’s handling of the Manitoba school crisis. Bowell saved face by turning power over to Charles Tupper, High Commissioner to Great Britian. Bowell resigned a few months later. He was appointed to the senate in 1892.